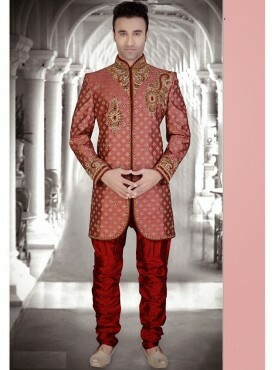 When it comes to ethnic clothing for men, nothing beats the classy looks and grandeur of a Sherwani. 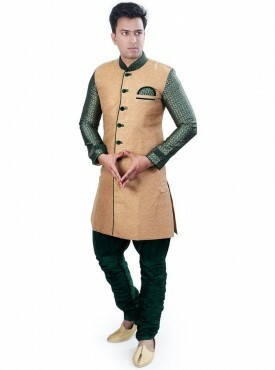 Sherwani for men has been a quintessential garment since the ancient times. 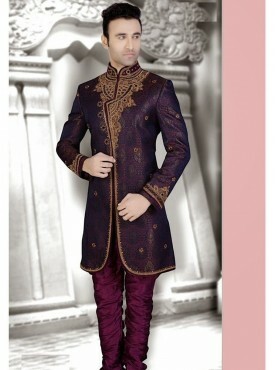 History, Sherwani was associated with royalty. 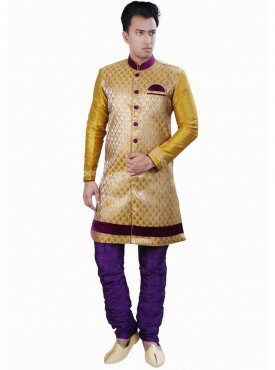 However, in the contemporary age, Sherwani is worn for celebrations and traditional occasions. 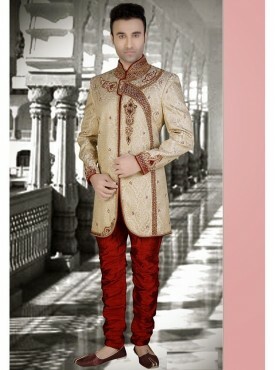 Sherwanis are a hot favorite among Indian bridegrooms due to its extremely refined looks. It's not just weddinged; sherwanis can also be worn for some occasions such as the traditional day at college, friend’s wedding, festivals and religious celebrations. 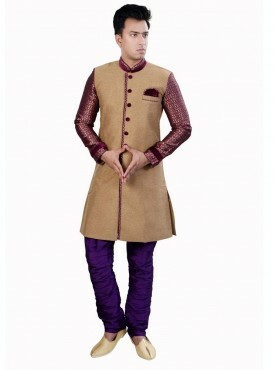 A sherwani is typically paired with a Nehru jacket, chudidar and classic sandals for men such as Jootis and Mojris. 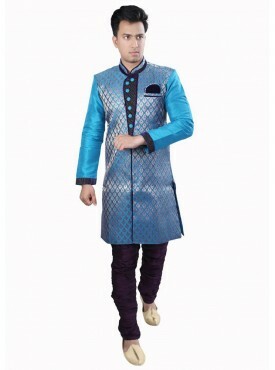 Violet indigo Brocade readymade sherwani designed with stone, beads and resham. It comes along with Purple dupion art silk churidar. 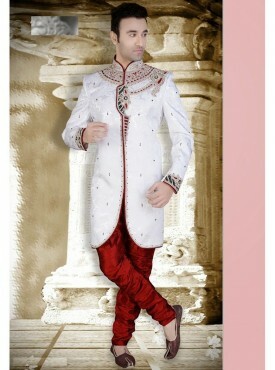 White art silk readymade sherwani designed with stone, sequins and resham. It comes along with Red dupion art silk churidar. 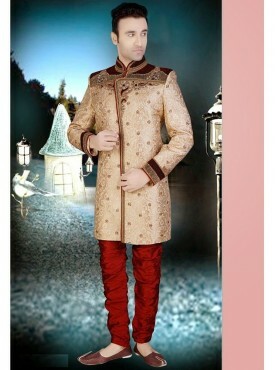 White Art silk sherwani with maroon cotton silk churidar crafted with stone embroidery work. Add a majestic touch to your wedding day with this extremely stylish Copper readymade sherwani embroidered with stone and zari work. Available with maroon art silk Churidar. Step into an uncharted territory wearing this Grey Color brocade kurta designed with button, beads and zari. Available with Red art silk churidar. 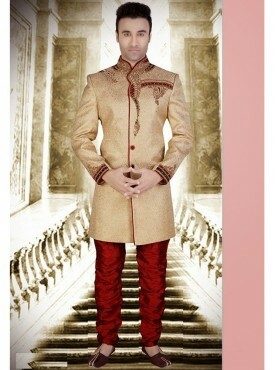 Cream jacqaurd sherwani designed with beads and stone work. Red poly silk churidar comes along with this. Be at the forefront of ethnic fashion wearing this Off White Brocade readymade sherwani embroidered with stone, zari and button work. Available with maroon art silk churidar. Indulge yourself in celebration mood in this ethnic Maroon Brocade readymade sherwani embroidered with beads and zari work. Available with Red art silk narrow patiala. 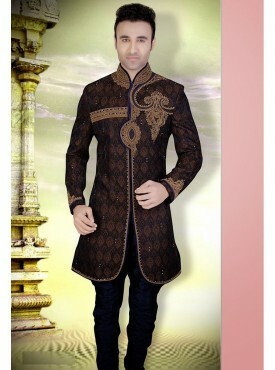 Charcoal Cream Brocade readymade sherwani designed with sequins, beads and stone work. 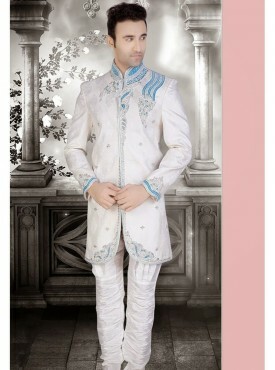 White linen readymade sherwani designed with stone, beads and resham. It comes along with Purple dupion art silk churidar. 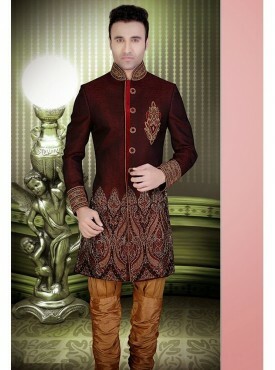 Maroon Art Silk readymade sherwani designed with stone, sequins and resham. 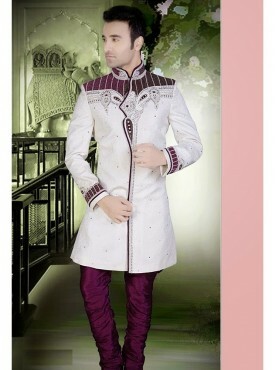 Cotton fabric is used as lining of the sherwani. 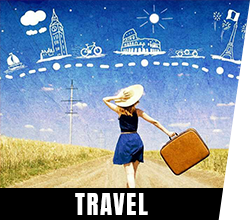 It comes along with Chikoo color dupion art silk churidar. 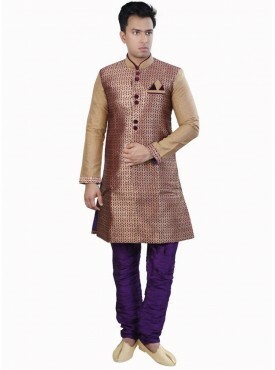 Maroon brocade sherwani with Chikoo cotton silk churidar crafted with stone embroidery work. Add a majestic touch to your wedding day with this extremely stylish Black Brocade sherwani embroidered with stone and zari work. Available with Black art silk Churidar. 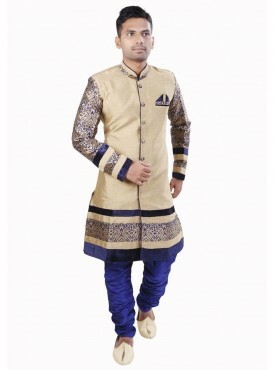 Step into an uncharted territory wearing this Cream kurta designed with button, beads and zari. Available with Red art silk churidar. 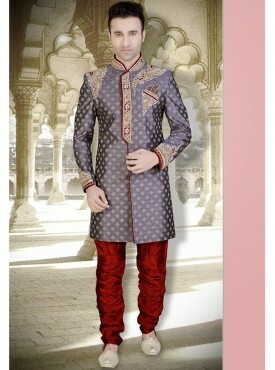 Silver Brocade sherwani designed with beads and stone work. Black poly silk churidar comes along with this. Be at the forefront of ethnic fashion wearing this teal Black Brocade readymade sherwani embroidered with stone, zari and button work. Available with black art silk churidar. 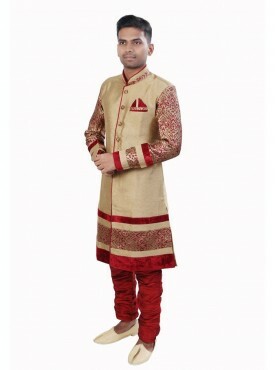 Indulge yourself in celebration mood in this ethnic White sherwani embroidered with beads and zari work. Available with White art silk narrow patiala. Charcoal Cream banarasi Brocade readymade sherwani designed with sequins, beads and stone work.Available with Red art silk narrow patiala. 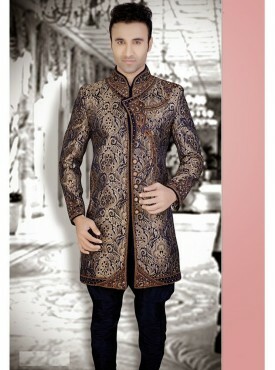 When it comes to ethnic clothing for men, nothing beats the classy looks and grandeur of a Sherwani. 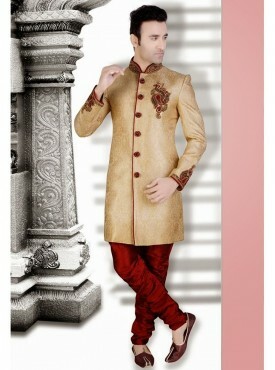 Sherwani for men has been a quintessential garment since the ancient times. 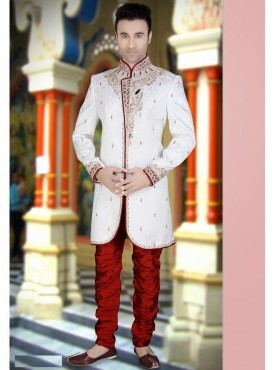 History, Sherwani was associated with royalty. 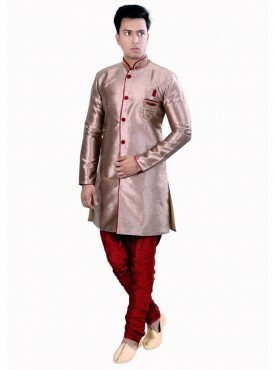 However, in the contemporary age, Sherwani is worn for celebrations and traditional occasions. 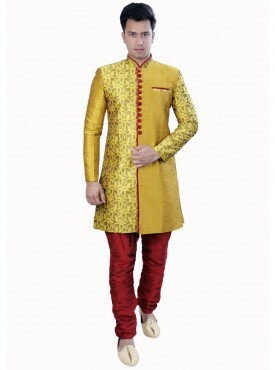 Sherwanis are a hot favorite among Indian bridegrooms due to its extremely refined looks. It's not just weddinged; sherwanis can also be worn for some occasions such as the traditional day at college, friend’s wedding, festivals and religious celebrations. 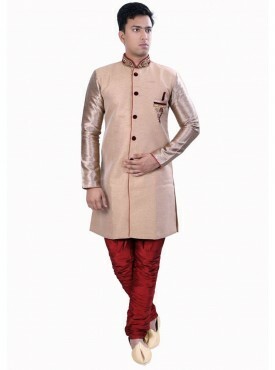 A sherwani is typically paired with a Nehru jacket, chudidar and classic sandals for men such as Jootis and Mojris. 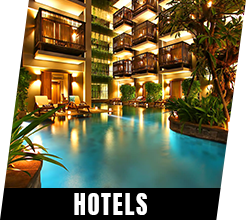 They are usually available in warm colors such as shades of red, orange, and gold. If you want to try something different you can also choose colors such as imperial blue or rich purple. 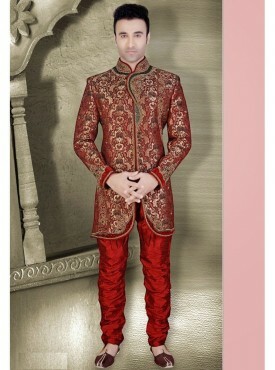 At Acchajee, you get to choose sherwanis from the best designer labels. 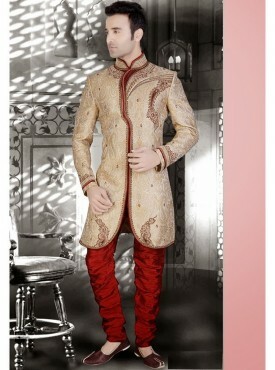 Be it a traditional sherwani or an indo-western one; we have it all. 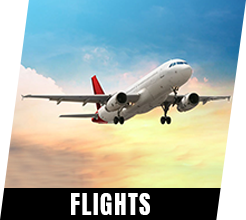 The plethora of sherwanis and men’s kurtas will ensure that your online shopping experience with Acchajee is an absolute pleasure. With a broad range of sherwanis to choose from, you will be spoilt for choice. Choose from a range of sherwanis such as Hyderabadi Sherwani, Jodhpuri Sherwani, Pakistani Sherwani or a Punjabi sherwani. 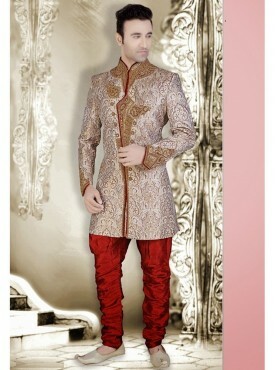 Go for a silk or velvety sherwani for a grand occasion or settle for a cotton one if you want to keep it simple. 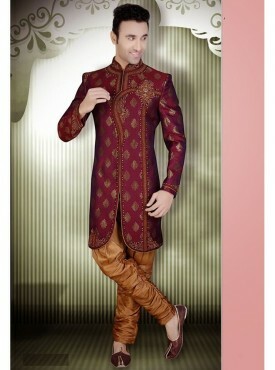 Choose an elegant sherwani, and you are just one step away from looking handsome and suave for that special occasion. 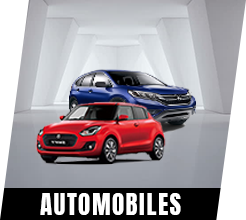 All, you need to do is select your favorite one, and have them delivered to your doorstep right away!